Boys have been dressed in enumerable different styles over the past 500 years. Little boys and girls were generally dressed alike in nearly identical dresses until the boys were "breched" at any time from 4 to 6 years of age. After being breeched, boys during most of this period were dressed in minature editions of their parents' clothes. Toward the end of the 18th Century, new juvenile fashions began to appear for children. Some of the first such styles were sailor and skeleton suits. 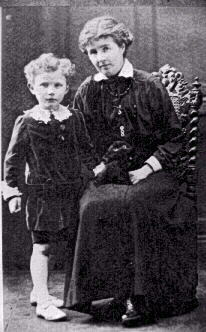 In some cases mothers have combined styles, such as using a kilt skirt with a Fautleroy or sailor suit. Boys in the 19th Century and throughout much of the 20th Century wore distinctly juvenile fashions. In recent years, however, boys when they dressed up generally wore suits just like their fathers, including long pants. Boys now have a great deal of say in the clothes purchased for them. As a result, the current styles probably reprsent more than ever before what the boys themselves actually want to wear. For the most part, comfortable, casual styles have emerged as the standards for juvenile attire. Other interesting boyish clothes emerged in the 20th century. Scouts and variuous youth groups adapted uniforms. Distictive dress were adopted by dance and choral groups. Other distinctive clothes are associated with different natiinal groups such as kilts (Ireland and Scotlnd), ??? (Greece), liederhosen (Germany), and other garmets in various countries. Various countries also developed a variety of school uniforms.